Koreatown residents are fighting to keep homeless housing out of their neighborhood. What does this mean for efforts to build a shelter in every LA council district? The city of Los Angeles has been addressing the homelessness crisis by approving new shelters and turning old motels into temporary shelters. But it hasn’t been enough to turn the tide. Now LA Mayor Eric Garcetti has a $20 million campaign called “A Bridge Home” to open new shelters in each of the 15 council districts, including sites in Westwood, Studio City, Chinatown, Van Nuys and Hollywood. 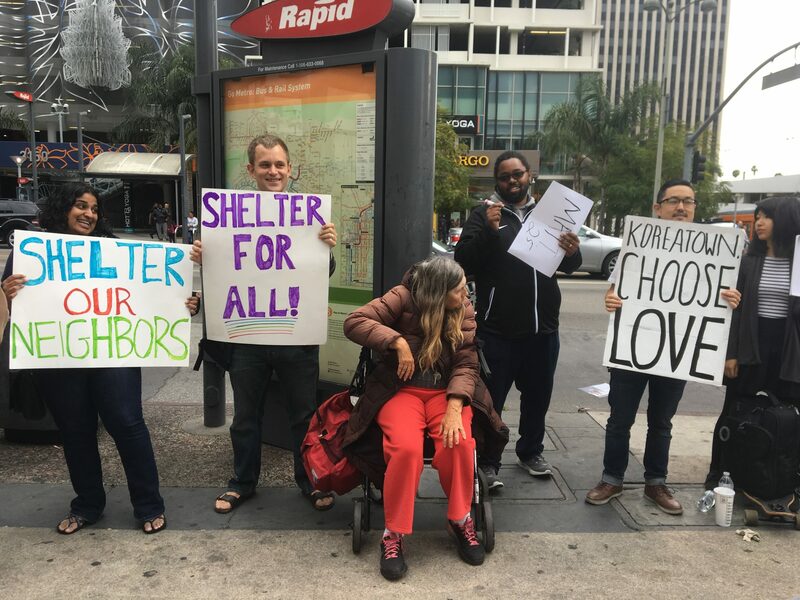 Resistance is growing in Koreatown, where more than 8,500 people have signed a petition opposing plans to construct a temporary shelter on a city-owned parking lot at 682 S. Vermont. 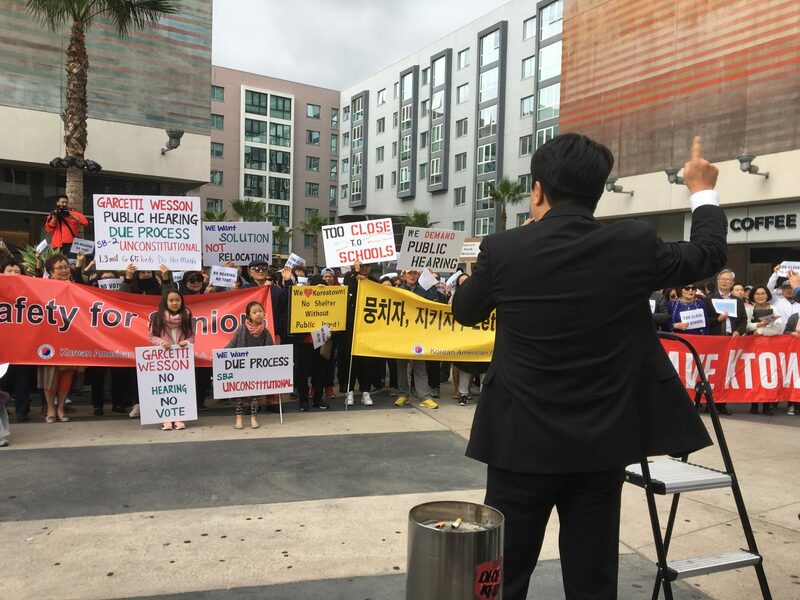 Jake Jeong, an attorney and community leader in Koreatown, leads the crowd in a call and response demanding a public hearing on the proposed temporary homeless shelter at 7th and Vermont. Photos by Avishay Artsy. Officials say this site was selected based on data of homeless encampments in Koreatown. They estimate there are about 400 homeless people living in Koreatown. The temporary facility will be open for a maximum of 3 years. Dozens of people gathered at the Wilshire/Vermont Metro station plaza on Saturday afternoon. They spoke out against the proposed 65-bed shelter. Jake Jeong, a local attorney, led the crowd in chanting their demand for a public hearing. “What’s the justification for not having public hearing? We want to help. We want to be part of this decision making procedure. That’s all we want,” Jeong said. Koreatown is part of the 10th Council district, represented by City Council President Herb Wesson. Garcetti and Wesson, along with Councilman David Ryu, a Korean American, met with neighborhood groups and held a news conference specifically for Korean-language media. But protesters say it’s not enough. Myung Jin worries that her 13-year-old autistic son will be less safe if he has to talk by a homeless shelter on his way to school every day. Residents also expressed concerns about homeless people bringing drugs and crime to the area. Officials counter that the housing will have 24/7 LAPD and Los Angeles Homeless Services Authority (LAHSA) presence. But there’s another issue. There are about 5 schools within a mile of the proposed shelter. One protester, Myung Jin, wore a shirt with the logo from her son’s school, just a short walk away. Her son is 13 and autistic, and she worries for his safety. 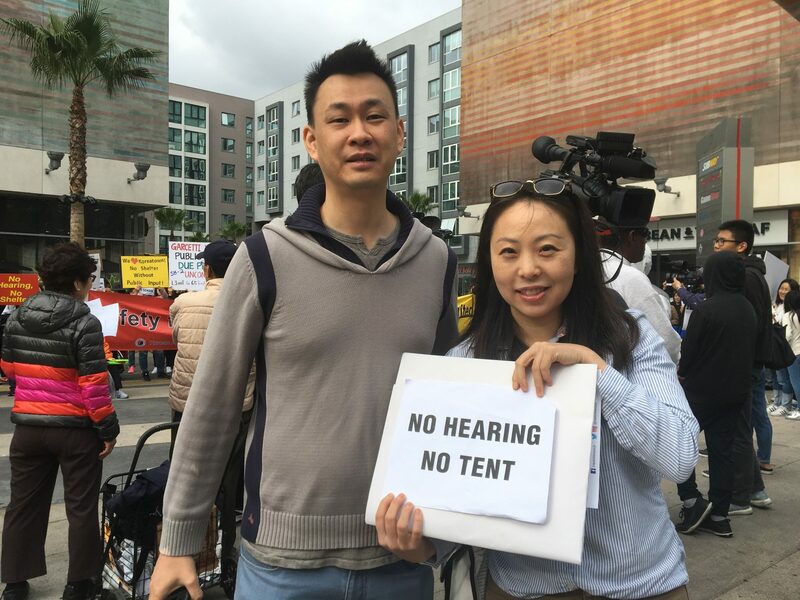 Some protesters also held signs reading “No hearing no tent.” There is some concern that the tent itself is a problem, while a permanent structure would blend into the neighborhood better. But it’s not clear what the temporary facility will look like. One rendering on Herb Wesson’s council district page shows it looking like a big tent. Garcetti’s campaign includes different kinds of emergency shelters, including tents, trailers, storage units and safe parking facilities. 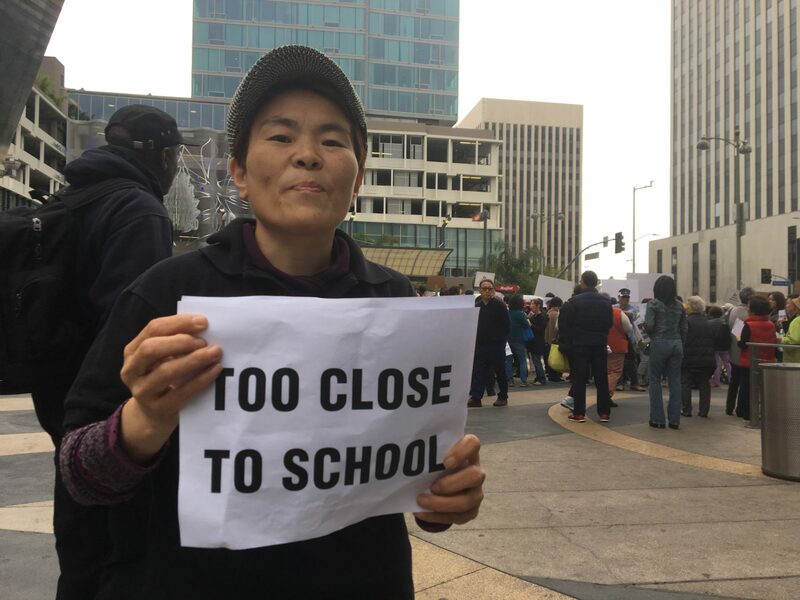 Jason Yeo and Angela Joo both say that homeless services and housing should be concentrated in downtown LA, rather than in neighborhoods like Koreatown. San Diego has experimented with a big tent. The nonprofit service provider Alpha Project put up a sprung structure that has heating, air conditioning and other amenities. “There’s proper ventilation. We have 325 people in here and sometimes we get a little ripe after it rains,” he said. McElroy said the city did not hold a public hearing before putting up the tent. But opponents in San Diego soon saw a reduction in crime, he said. “This is the typical NIMBY mantra. We don’t call them NIMBYs anymore. We call them CAVE-dwellers: Citizens Against Virtually Everything. And that’s exactly what they are,” he said. Johnny Lee is a restaurant owner in Koreatown and thinks a homeless shelter will improve the neighborhood. The shelter is bringing up some deep-seated anxieties within the Korean-American community that they’re not being listened to. “Maybe people think we are selfish [because] we [are] against the homeless shelter. We are not selfish. We’re just asking, they have to respect us, ok? We work hard, we pay taxes, and they are not hearing us. They are not respecting us. That’s not fair,” said one of the protesters, Karen Lee. Emmanuel Han says he would welcome a homeless shelter in Koreatown that is further away from businesses and schools. That feeling goes back to the 1992 riots/civil unrest and the feeling that law enforcement didn’t do enough to protect Korean store owners. “After 1992 when this community was burned to the ground, it was built up by the blood, sweat and tears of Korean Americans. And it’s just finally been revitalized and has actually been improving for the past couple of decades,” said protester Emmanuel Han. There’s also a stereotype that Koreans are more focused on family and business and uninterested in local politics, and are expected to go along passively with the city’s plan. That’s something Angela Joo, another Koreatown resident, addressed. 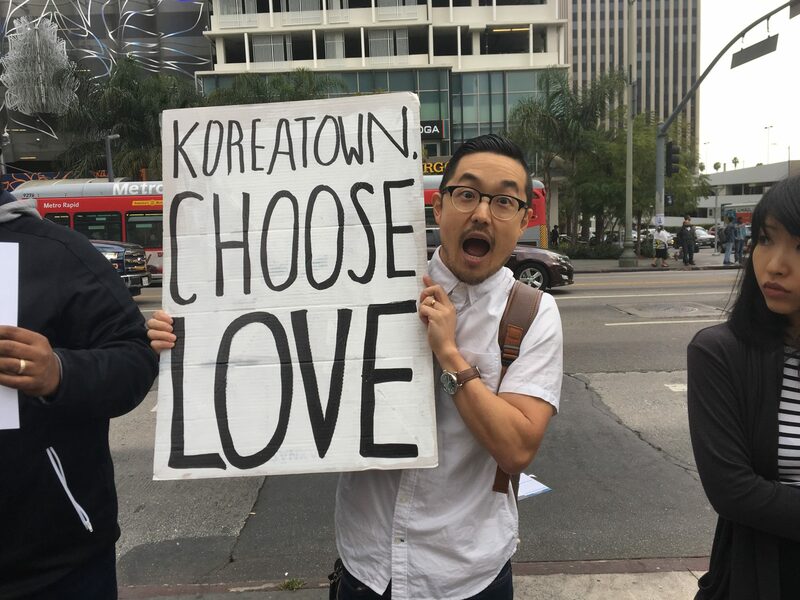 “Koreatown has a history of being disenfranchised and has a history of marginalization because they think that Koreatown residents don’t vote and they don’t complain,” she said. There’s also a belief among Korean-Americans that homelessness is not an issue facing their community. According to LA homeless statistics, LA County is 14 percent Asian/Pacific Islander, but that group makes up just 1 percent of the homeless population. No other group – white, black, or Latino – can compare with that ratio. 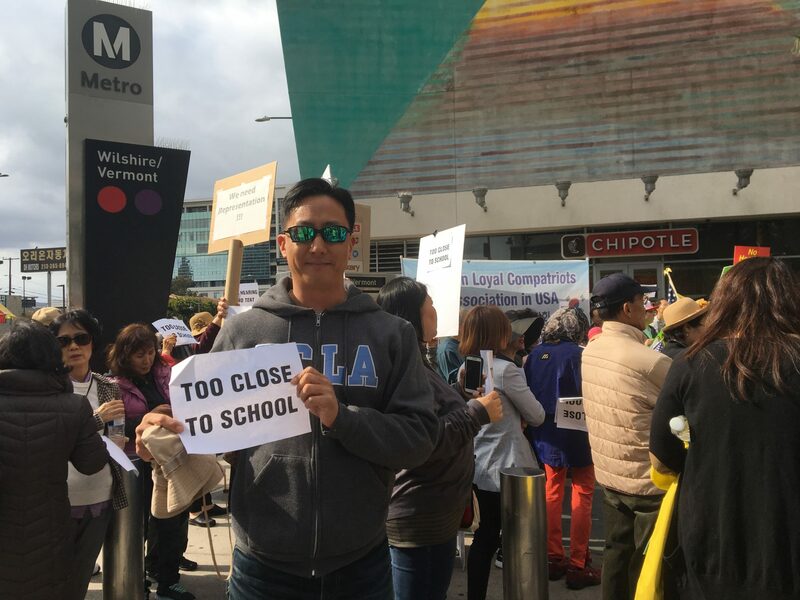 Raymond Kim, who runs the Facebook page that opposes the Koreatown shelter, raised the issue of support structures between families and friends. “Everyone in Koreatown has a friend or a family that’s been in terrible condition they’ve had they’ve been down on their luck and they’ve housed them. I’ve done that. Everybody here has housed a family member or a friend. We put in our fair share of taking care of people. There would be way more homeless if we didn’t take care of our friends and our family,” Kim said. But there is also a hidden Korean American homeless community that sleeps in 24-hour spas and local churches. That’s according to Joon Bang, the executive director of the Korean American Coalition-Los Angeles. The protesters say they’ll come back to this location every weekend until Councilman Wesson grants them a public hearing. Wesson says there will be a council committee hearing but it hasn’t been scheduled. A small group of counter-demonstrators showed their support for the proposed homeless shelter. Activists say several lawsuits are being filed. In Venice, two community groups are suing the city of Los Angeles over a pair of new laws that are meant to make it easier to shelter homeless people. Koreatown resident Andrew Cohen observed the rally, and said he expects to see more of these kinds of protests. “I saw the protests against the homeless shelters in Irvine, and that was disgusting. And I was like, at least we don’t deal with that in LA. And then lo and behold, here we are,” Cohen said. There is also a political deadline here. Besides the Olympics coming in a decade, Garcetti is considering a run for president, with recent visits to Iowa and New Hampshire, and solving homelessness is going to be his biggest challenge. And Council President Wesson has been talked about as a potential mayoral candidate. So there’s a political timetable for building homeless shelters in Koreatown and elsewhere.